Sheet pan meals are new to me. I don’t know why. They’re brilliant. Once you chop the veggies, you’re done. And even better is the fact that the entire meal is done at once. No trying to keep your side dish warm while the meat finishes cooking. Nope. It all goes in on one pan. It all comes out on one pan. Bravo! Bravo! 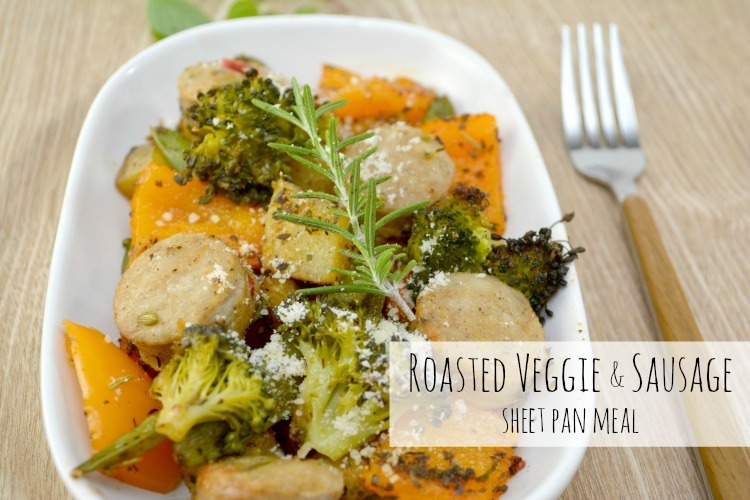 This Roasted Veggie and Sausage Sheet Pan Meal is one the whole family is going to love! The entire dinner cooks on one (just ONE) pan! It’s easy. There’s less dishes. It’s easy! I appreciate the variety of color in this recipe. It’s not just because it’s pretty that I like it, but because as the saying goes, “The more colorful your plate is, the more healthy the meal.” Okay, so that’s not a direct quote, but you get the picture. Now here’s the best part. What I really love is that you chunk the veggies. The recipe says chop into small pieces, but look at the picture and we’ve got chunks going on. Yes, CHUNK! Small chunks, but still… chunks! I think everything I make requires dicing or thinly slicing. Sometimes I just want to chunk it and get it over with. You know what I mean? Chunks, people! Momma loves chunks! 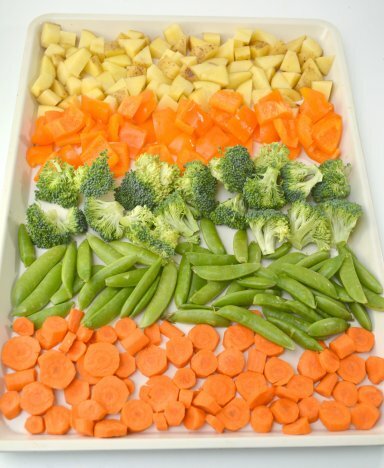 After you cut the vegetables, spread them into a single layer on your baking sheet. Honestly, I don’t know that it really matters if you mix them up or group each veggie. They all cook the same and they get mixed up in the end anyways. This way just looks fancier and well, you know me! Wink, wink. 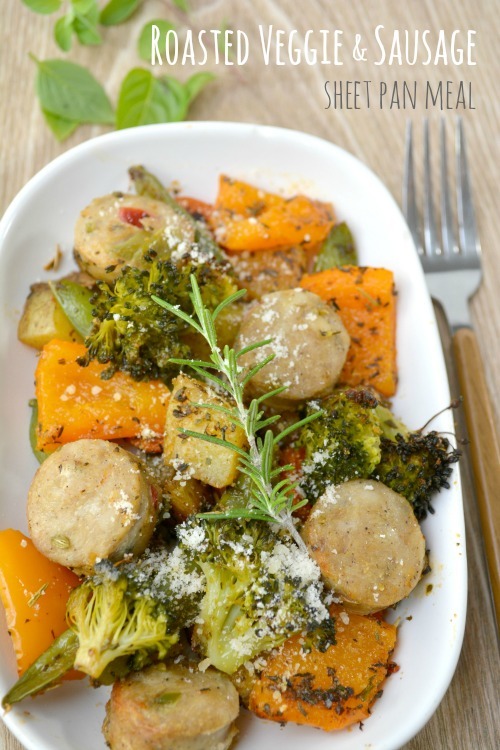 Drizzle the pan of veggies with the herb topping. 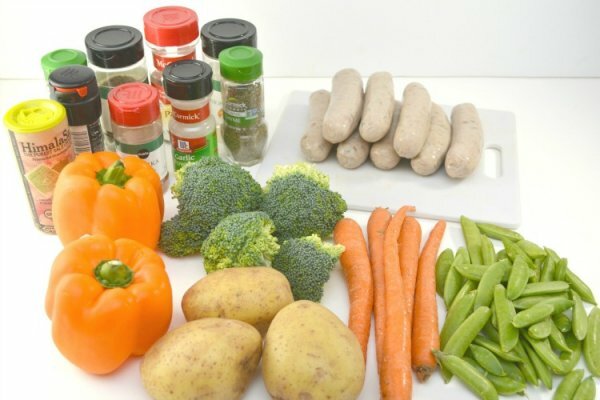 Cut the sausage and add over the herb coated veggies, This way the juice from the meat cooks out onto the veggies and keeps them moist. Then… you’re done! Well, besides the obvious turning the oven on, putting the dish in the oven and starting the timer. Anyone else hate it when you put a pot on the stove, but forget to light the burner? Please tell me that’s not just me! When the sheet pan comes out of the oven, scoop the veggies and sausage together into a serving dish. Now you’ve got yourself a gourmet meal in both looks and taste! And seriously, don’t we all want it to look like we slaved all day over a meal?! Beautiful! Begin by chopping all of your vegetables. Potatoes, carrots and peppers should be chopped into small pieces. Broccoli should be chopped into florets, and the snow peas should be left whole. Place all of your prepared vegetables on a large sheet pan. Mix together olive oil and all seasonings in a bowl. Toss all of the vegetables on the sheet pan in the olive oil and herb mixture. 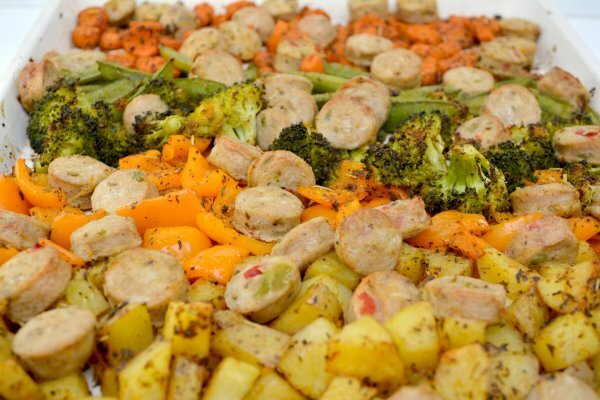 Chop your Italian chicken sausage into small circles and layer over the veggies on the sheet tray. Place the sheet tray in the oven for 15 minutes. Take the sheet tray out, toss vegetables and cook for an additional 10-15 minutes. Keep an eye on the meal throughout this last bit of cooking time to ensure an even cook that doesn’t burn. Serve over rice or on its own with a garnish of fresh herbs and parmesan cheese if desired. Okay, tell me what you think in the comments. Give me the truth, the whole truth, and nothing but the truth!